The sport of athletics relies on a considerable number of volunteer helpers and technical officials. Below are listed the Merseyside officials. Anyone wishing to get involved as an official or wishing to progress along the officials grading pathway can get further information from Ron Scott, the Merseyside Officials Secretary. There is also a wealth of information on the Officials Section of the England Athletics website. 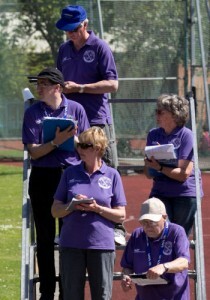 Athletics Technical Officials are licensed by UKA and are subject to technical and Health and Safety training. Regular enhanced Criminal Records Bureau checks are also carried out under the national safeguarding procedures to ensure the safety of young people and vulnerable adults. Level 1 is the starting level for club officials and Merseyside offers courses for new Level 1 T&F officials , usually in February / March before the new season starts. The course provides a generic and discipline-specific classroom session for starter/marksmen, track judges, field judges and timekeepers. Having attended the course, the candidate maintains a logbook of practical officiating experience over 4/5 meetings, completes a straightforward application and the official is usually accredited very quickly at Level 1 by UKA and issued with a licence. Further progression to Level 2, 3 and 4 is based on experience and assessment. Several Merseyside clubs have their own officials’ secretary or co-ordinator and these can be a good initial source of information. Anyone wishing to get more involved as a helper or official will find a warm welcome from these club contacts.